George T. Anthony is one of four Kansas governors who chose Topeka Cemetery as their final resting place. 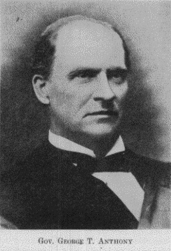 The seventh governor of Kansas (1877-1879), he was a relative latecomer to the state. After serving in the Seventeenth New York Independent Battery of Light Artillery, he made his way west, settling in Leavenworth in 1865. There, he edited the Leavenworth Daily Bulletin and the Leavenworth Daily Conservative. He later bought the Kansas Farmer newspaper. The knowledge he gained editing the Farmer put him in good stead to gain the presidency of the Kansas Board of Agriculture. He also served on the committee that created the state’s centennial exhibit for the 1876 celebration in Philadelphia. The display was designed to show the abundance of Kansas agriculture. That same year, Anthony was nominated by the Republican party for governor. His opponents tried to discredit his service during the war, but the party stuck with Anthony, and he was elected. He served a single term. He was the first governor to have a telephone in his office, and the first governor to address the Legislature in person. After leaving the governor’s office, Anthony served as a state representative from Leavenworth County. He had a farm in Pottawatomie County and started investing in railroads and became a member of the State Railroad Commission. His last foray into politics was a run for Congress in 1892, but he was defeated. He is buried in Section 57, Lot 5 with his wife, Rosa Lyon, and son George H. Anthony and his wife, Emaline.